Using only the notes of the D major scale, Richard Meyer has fashioned a medieval-sounding piece that is sure to fascinate your beginning string students. The minor key, modal harmonies and driving rhythms give this piece a very mature sound. 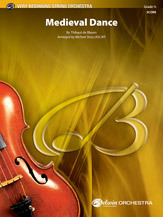 The aggressive main theme is introduced by violins and violas, with cello and bass in counterpoint. The theme later returns in canon, with cellos and basses being chased (hunted) by the violins and violas. Very dramatic from start to finish! This product was added to our catalog on Thursday 17 November, 2005.